8 Mc Elhone Cottages is a newly renovated three bedroom semi detached holiday home in a stunning location in Downings Village. The modern cottage has exceptional views overlooking Downings Bay, and is ideally situate within a two minute walk to Downings Bars, Restuarants, Hotels, Beaches and amenities. The property is well placed along the Wild Atlantic Way, with an abundance of hikes and walks near at hand. 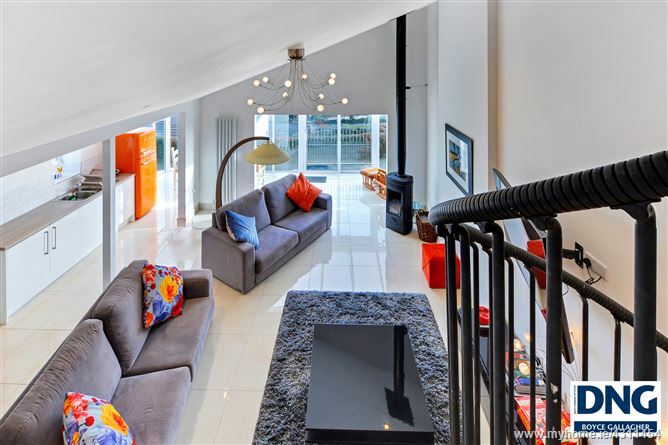 This stylish home has an open plan interior, encompassing a sunroom/dining area with spectacular views, a sleek kitchen, a lounge at the centre and a spiralling staircase which leads to an overhead bedroom alcove. There are a further two bedrooms on the ground floor and a main bathroom. This property will not be around for long, and we recommend early viewings. Tiled flooring. Excellent Sea Views. Tiled flooring. High and low level high shine units with tiling in between. Chrome extractor fan. Ceramic touch electric hob and oven. Stainless steel sink. Smeg Fridge Freezer. Spot lighting. Tiled flooring. Plumbed for washing machine and dryer. Access to rear yard. White WC, full tiling to surround. Round exposed thermostatic mixer shower in glass cubicle. White WHB. Chrome Accessories. Tiled flooring. Spot lighting. Rear Yard: 9m x 8m, fully secured. Two minute walk to the beach. Award winning Golf Resort within ease of access. Within two minutes walk to Bars, Village Centre, Restaurants and all facilities. Modern and contemporary finish throughout. Sun Room to front aspect overlooking Downings Bay.